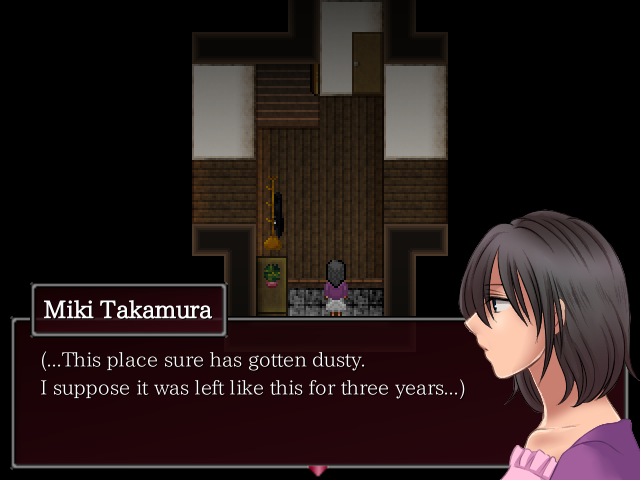 Paranoiac is a freeware horror adventure game by Uri made in WOLF RPG Editor. Discussion of depression and ableism. If dialogue doesn't show up or uses the wrong font (which may cause cutoff text), download and install MS Mincho. If pictures aren't appearing where it seems they should, you must run the game as an administrator. Right-click Game.exe, go to Properties, and under the Compatibility tab, check "Run this program as an administator." I've provided a walkthrough. Don't be afraid to consult it, as the game can be... obtuse. A phone will ring while in the entry hall. Go to the dining room (1F east, right door) to answer it. Go to the bathroom (1F center, right door) to take a shower. Try to go upstairs, and get the key from the coat rack when it falls over. Go to the guest room (2F center, left door) and sleep in the bed. Go to the kitchen (1F east, left door) and use the sink. Go back upstairs. When you head for the west side of 2F, the right door in the center area will open by itself. Go into the study (2F center, right door). Check the stain on the floor, and check the far-right bookshelf for a note. Leave and try to return to the guest room. HIDING PLACE 1: Dresser on the right side of the bathroom (1F center, right door). Go to the safe in the living room (1F west, top doors) and enter the code ("saeki" or "Saeki") for a key. Use one of your keys to open the dressing room (2F west, bottom-left door). Check the dresser drawer for a note. Go downstairs and answer the phone in the dining room (1F east, right door). Go to the garden (1F east, right exit). Check the flowers at the bottom and dig them out for a key. Use one of your keys to open the storehouse (2F west, top-left door). Check the shelves on the left for a key. 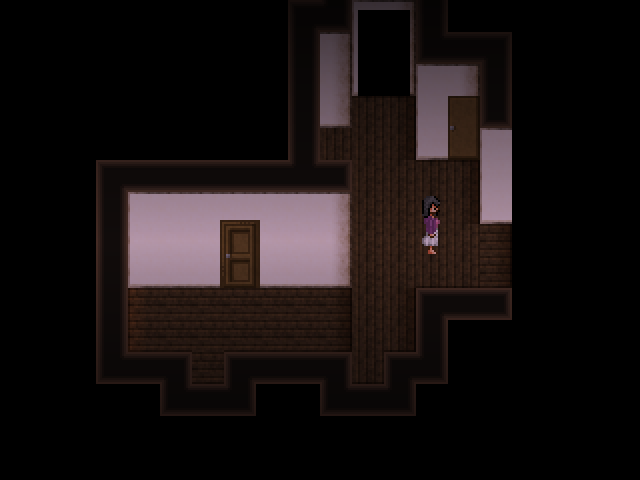 Use one of your keys to open auntie's room (2F east, lower-left door) and look around. Answer the phone in the dining room (1F east, right door). HIDING PLACE 2: The dresser on the left side of the dressing room (2F west, bottom-left door). Use the remaining key to open the uncle's room (2F east, lower-right door). Check the empty bookshelves (a specific tile) for a note. Go to the dressing room (2F west, bottom-left door) and check the pink dress for a key. Use the key to open the piano room (1F west, bottom door). Play the piano for a key. Go to the east side of 2F. Go to the piano room (1F west, bottom door) and check the piano. 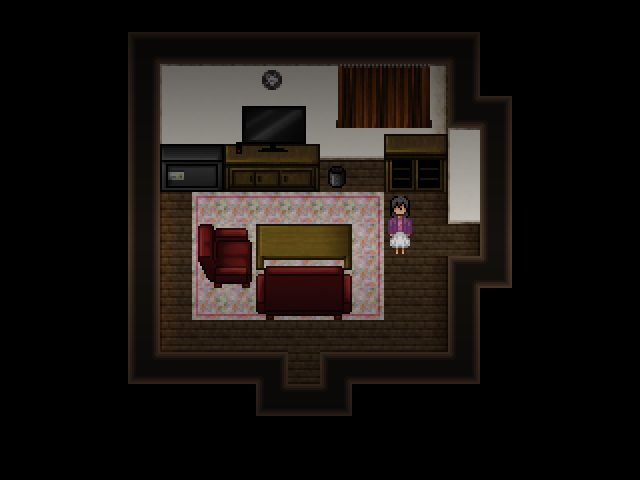 HIDING PLACE 3: The dresser in the lower-left of the uncle's room (2F east, lower-right door). Go to the phone in the dining room (1F east, right door) and call mom. Use the key to open the nursery (2F west, bottom-right door). Check the trash can for a note. Go to the uncle's room (2F east, lower-right door). Turn on the lamp, turn off this lightswitch, and check the lamp for a key. Use the key to open the bedroom (2F west, upper-right door). Check the left nightstand for a note. Go to the garden (1F east, right exit) and check the well for a key. Check the upper wall. Keep moving. (If you want to make saves, make them at the END of each area, not the beginning. The monster stops when the menu is open, but the timer for it changing areas will still run. Look around the house, then go to bed. Try to leave the house. HIDING PLACE 4: The sliding closet on the right side of the traditional Japanese room (1F east, bottom door). Use the key to unlock the door by the stairs to the basement. Check the dresser outside the bathroom on 2F for a flashlight and go back downstairs. Check the upper-right corner of the stuffed animal room for a code. Use the code (2436) on the computer in auntie's room (2F east, lower-left door). You should save before answering the door. Go to the study (2F center, right door). HIDING PLACE 5: Head to the basement.